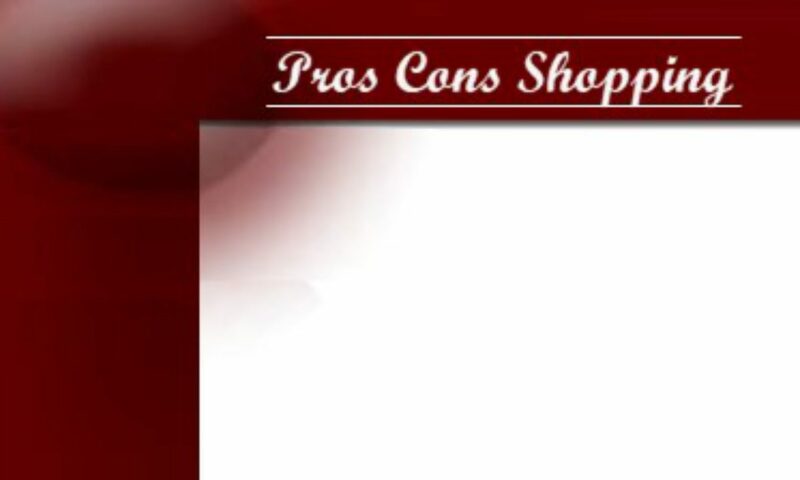 Pros Cons Shopping is here to help you discover the pros and cons of useful products known as best sellers and best rated. The pros and cons are based on our usage of the product, the details about the product, what others say, the sales volume and the consumer product ratings. Pros Cons Shopping is designed to make your shopping experience more reliable, satisfying and faster. We do a lot of research before buying. Rather than discard our hours of effort, we decided to share our findings on products we have tried and like. What is Pros Cons Shopping? Pros Cons Shopping is a shopping process. Identify a product of need defining why it is needed, what value owning the product will provide, and how it will solve an existing need or problem. Without a strong sense of need, an item may result in a shopping spree. Search for the items available to meet the need or solve the problem. We use Amazon because it is the world’s largest store. Many items will seem to fit the bill. Look for the highest rated items based on customer reviews discovered in the prior search. Read the product description, specifications and contact the manufacturer for unanswered questions. Based on knowledge of what the product is and does, decide if it is something worth pursuing. Read existing customer reviews identifying the good and the bad to determine if there are any additional cons to be concerned about. Decide if the pros far outweigh the cons and if the cons are not serious risk stoppers. Look for additional similar products with similar ratings. Compare the similar product specifications and obtain the review counts. The more reviews, the more reliable the overall customer review rating becomes and the more the confidence level grows towards a purchase. Construct a list of pros and cons for each of the remaining items. Decide which remaining ones seem to best fulfill the requirements. Determine if they meet what is desired. Determine if there are beneficial bells and whistles that offer a real ownership plus. Compare prices. Based on one’s budget which item best stays within the budget limitations. Additionally decide if the extra benefits are worth the extra cost. Use the product, keeping in mind the expectations. Determine if the prior research conclusions coincide with the usage experience. Submit a review to help others with their purchase. Following a proven process leads to product satisfaction. Being methodical gives the mind time to process the discovered results. Taking advantage of prior research results will save shopping time. Shopping based on pros and cons with reviews to substantiate them will result in high product satisfaction after purchase. We do not like to buy something that does not meet our expectations. In our early shopping years we did not identify our needs clearly and thus ended up with items that did not meet our needs. So our relatives, friends and garage sales were the recipients of our poor choices. Before Pros Cons Shopping, our knowledge of what was available was limited. We knew basically what we wanted, but later learned that we could have enjoyed so many more bells and whistles. Sharing our research results seems to be the right thing to do. Since following the shopping process takes a lot of time, we decided to share our results with you so you can save some precious time when shopping online. Why discard what we have done? Your time is as limited and special as ours is. We hope you find the research results helpful. Since we do not experience as many product disappointments now, we have additional spending money to buy things we wish we could own. Allowing the shopping process to work for us, we feel our budget allowance has expanded. The elimination of dud products has brought big benefits. Never before have shoppers been so blessed with so many sources for information. With internet access, shopping online has become very popular. Gone are the days of standing in a physical store relaying on the product label to satisfy the desire for information. Gone too are the days when bad products go unnoticed. The internet provides a wealth of easy to access information. Manufacturers can provide so much more information about their products, their manufacturing process, materials used with demonstrated quality control through their company website. Website stores can supplement the manufacturer’s product information with dialogue, videos, customer reviews and so much more. Online marketers can provide additional research, product comparisons, product videos and testimonials. Quality organizations can post failed compliances and recalls are readily available. Tweets and Facebook are filled with product comments. Our goal is to provide valuable information to help you in the shopping process. We are continually reviewing new products so please visit us again and again. It is very rewarding to share our research conclusions with you. May you find the best products for your shopping needs.